The process of ‘property development’ mostly known under the all-enveloping heading of ‘Planning’ is probably one of the most emotive disciplines encountered by your Parish Council, particularly by its Planning Committee. 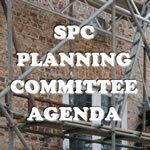 Planning Applications made to our Local Authority, Wokingham Borough Council, for works in Sonning Parish are assessed by your Parish Councils’ Planning Committee via its twice monthly public meetings (Wednesday in the week following the week in which the Parish Council met, and Monday in the week before). Applications are discussed and assessed, normally following site visits, against National and Local Planning Guidance. Conclusions are then submitted to WBC on or before the important closing date for comments. In rare cases where our Planning Committee considers that an application should be refused or approved against the Local Authority notifying their intention to take an opposite decision, it is possible to ‘list’ the application for consideration by Wokingham Borough Council’s ‘Planning Committee’. A committee of elected Borough Councillors have the power to decide whether to approve or refuse planning applications, after taking into account spoken submissions from residents, Councillors and applicants, at their regular monthly meetings. 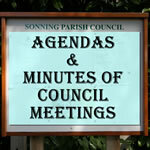 Our Committee also consider connected matters, such as new planning and highways guidance documents, reports of planning infringements etc. Meetings are held in the public domain for anyone to attend and listen to what is said (normally in the King George V Field pavilion; for times see agendas on our notice boards). Please bear in mind that our meetings are not a forum for applicants to present their plans. Anyone can speak at the discretion of the Chairman. You can search for Planning Applications or Decisions by using Wokingham Borough Council's site (see below). It is a large database so you are advised to use the Application No. or Keywords (eg. Pearson Road) or to narrow your search. Or select "Applications" as well as setting "Sonning" from the drop-down list of Parishes, unless you want hundreds of pages to look through. This is a direct link to the WBC Planning Applications Database on their website.